The old method for plywood underlayment tile installation involved lots of thinset laid directly onto the subfloor. These days, there are a few different ways to prepare subfloor for tile. The method you choose depends on the type of tile you are planning to use. Let’s get started! When it comes to installing vinyl tile on plywood subfloor, the process is quick and simple. These self-adhesive tiles bond to plywood with ease, so long as the wood is clean, dry, and secure. 1. Start by walking the entire floor using a back and forth grid pattern. Use a pencil or a piece of chalk to mark any areas that squeak or feel loose. Don’t skip this step. It’s an essential part of preparing a plywood subfloor for vinyl tile, as the weight of the tile will make any squeaks worse, and loose spots could cause imperfections to appear on the tile’s surface. 2. After you’ve walked the floor and identified potential trouble spots, go back and add new nails to the areas that need reinforcement. 3. Mix a batch of wood leveling compound, following the manufacturer’s instructions. The finished consistency should be a lot like creamy peanut butter. 4. With a putty knife or drywall knife, apply a generous layer of leveling compound to the subfloor’s seams. Let the compound dry for at least 30 minutes before moving on to the next step. 5. With a sander, use 100-grit sandpaper to smooth the seams. When you’re finished, they should be flush with the rest of the floor. 6. Vacuum the subfloor to remove all particles. Take your shoes off or wear protective covers to prevent debris from entering your work area. You’re ready to install your vinyl tiles! Get ready – and think about getting a helper! Preparing plywood for tiling of the traditional kind is an involved process with quite a bit of heavy lifting. When you’re finished, you’ll be rewarded with a durable floor that looks fantastic. The safest, most trouble-free method for prepping plywood subfloor for tiling involves the addition of a layer of cement backerboard, which will not interact with the moisture found in the mortar and grout that hold ceramic and porcelain tiles in place. While cement backerboard does represent a small investment, it will create an excellent bond, plus it will smooth out any imperfections in the plywood itself, so your floor will turn out better. 1. If you’re all the way down to a solid wood subfloor, you’re going to need to apply a layer of ½” plywood. Use proper adhesive and screws to complete this step so that your floor feels solid and motionless. 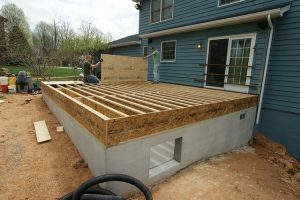 Once you have a plywood subfloor in place, you’re ready to level it. 2. Slide a 4- to 6- foot straight edge around the subfloor you’re prepping for tile. Go in all different directions, looking for valleys and hollows. If you find any uneven areas, they will need to be filled in with a layer of self-leveling underlayment before you move on to the next step. 3. If you are using self-leveling underlayment, use caulk to fill any seams in the subfloor. If there are vents in the area, use painter’s tape to cover them completely. 4. With a roller, apply a coat of latex primer/sealer to the subfloor. Next, pour the liquid underlayment into the hollow area. It will find its own level. When it is dry, your floor will be flat and even. Once the entire floor is level, you’re ready to apply a layer of thinset. 5. Note the direction of the plywood subfloor. You’re going to install your cement backerboard in the opposite direction to prevent shifting and cracking. If your plywood subfloor runs east and west, then your cement backerboards are going to run north and south. Apply a thin layer of polymer modified thinset as directed by the manufacturer. Double-check the instructions to ensure that you are mixing it correctly. 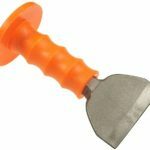 Use a trowel to scoop the thinset into place. Cover an area that’s just a touch larger than your first piece of backerboard. Comb the thinset at a 45-degree angle to the rest of the floor. Work quickly because it dries fast. Don’t skip this step! Some guides to DIY tile installation suggest laying the backerboard directly over the plywood subfloor without adding thinset but this can leave gaps that eventually lead to cracking. 6. Apply ½” cement backer board over the thinset and gently walk all over it to create a firm bond. Screw the backer board into place as directed by the manufacturer – usually applying screws ½ inch from the edges, 2 inches from the corners, and every 8 inches over the backerboard’s entire surface. Be sure to use the appropriate screws. 7. Repeat steps 5 and 6, staggering the sheets so that the ends do not line up with one another. You will need to leave a ¼” gap between the backerboards and any walls. Additionally, you will need to leave a 1/8” gap between the edges of the backerboards themselves. The easiest way to do this is to run 16D common nails into the floor along each edge, where it will meet the next backerboard. Let the nailheads protrude, because they will need to be pulled after all the backerboards have been screwed into place. 8. After the nails have been removed, use self-adhesive alkaline-resistant glass fiber tape to reinforce the joints. This tape is made specifically for use with backerboard. If you use non-adhesive tape, you will have to fill in all the joints with thinset mortar before setting the tape in place. 9. Cover the tape with a thin layer of thinset and level it with a straight edge. 10. Allow the floor to set before moving forward with your tiling project. This usually takes a day, however different products have different drying times, so you’ll want to double-check. Congratulations: You’ve successfully prepared your plywood subfloor for tile – either ceramic or porcelain tiles will work well with this configuration. How Much Time Does It Take to Prep Plywood Subfloor for Tile? As you now know, the process of preparing plywood subfloor for tiling depends on the type of tile being used, as well as the subfloor itself and of course, the size of the project. This process takes far less time and effort when you are installing vinyl tile, and it’s less of an investment. Prepping plywood subfloors for ceramic or porcelain tiles requires more in terms of time, labor and materials, but the result is a stiff, durable floor that will stand the test of time. The cost of preparing a subfloor for tile varies greatly, again depending on the type of flooring that you’re installing, as well as the condition of the subfloor itself. Preparing a subfloor for vinyl tile involves little in terms of material or labor; if you’re planning to complete this project yourself, this might be the way to go, however you should be aware that moisture can be a factor in how long your floor lasts. Prepping for travertine, ceramic, or porcelain tile will cost hundreds of dollars in small areas, and it could run into thousands in larger areas. Be sure to consider the cost of the tile itself when budgeting for this project. It’s worth noting here that you might qualify for a discount when purchasing large quantities of materials for your project. Be sure to shop around, as the savings could be significant.